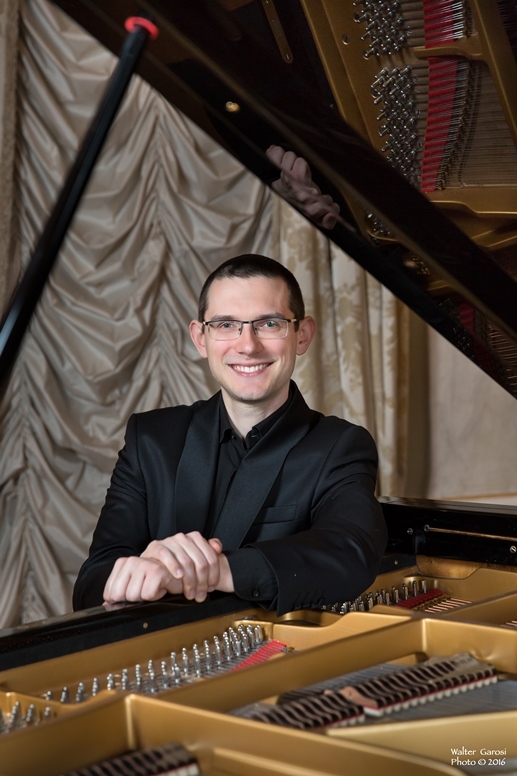 Jakub Tchorzewski is a Polish pianist specialized in chamber music repertory. He has performed across Europe and the United States, as well as in Japan and Brazil, while some of his past appearances have been recorded and broadcasted by Czech, Slovakian, Swiss, Italian and Polish national radios. Jakub Tchorzewski currently lives in Italy, where he has been invited to play at important music festivals like Biennale Musica in Venice, Serate Musicali in Milan, Bologna Festival and Nuova Consonanza Festival in Rome. Recently he performed in Rome at the Quirinale Palace, in Venice at the Teatro La Fenice, in Milan at the Teatro Filodrammatici, in Padova at the Pollini Auditorium, in Rovigo at the Accademia dei Concordi and in Trento at the Philharmonic Hall. Abroad he played at the Philharmonic Halls of Warsaw, Lviv and Bucarest as well as during Festivals “Warsaw Autumn”, “Poznań Musical Spring” and “Musical Autumn of Cluj-Napoca”. He has recorded ten well received by international music press Compact Discs, released by Acte Préalable, Dux, Musiques Suisses, Tactus, Vermeer and Warner/Polskie Nagrania labels. His interest in forgotten or rarely performed repertory led him to record World Premieres of such composers like Sándor Veress, Gino Gorini, René de Boisdeffre and Roman Palester. A dedicated chamber musician, Jakub has collaborated, among others, with acclaimed violinists Tomasz Tomaszewski and Dejan Bogdanovich, violists Jodi Levitz and Morgan O’Shaughnessey, cellists Bartosz Koziak and Luca Fiorentini, flutists Ginevra Petrucci and Carlo Tamponi, clarinetists Ludmila Peterkova and Vincenzo Paci, and ensembles like the Duo Viennese (Paweł Zalejski and Monika Hager-Zalejski) and the Guadagnini String Quartet. Jakub Tchorzewski graduated from the Fryderyk Chopin Academy of Music in Warsaw under guidance of prof. Alicja Paleta-Bugaj (piano) and prof. Krystyna Borucińska (chamber music). He studied also with prof. James Tocco at the Musikhochschule Lübeck, prof. Tomasz Herbut at the Hochschule der Künste Bern as well as prof. Mack McCray at the San Francisco Conservatory of Music. He worked as a collaborative pianist at Latina, Udine and Venice Conservatories and since 2014 he has been a member of the European Chamber Music Teachers' Association.